Blog of NairaforSMS; Nigerian bulk sms provider which offers cheap bulksms platform for sending bulk sms worldwide using customized sender ID at one unit per sms. There are some bulk sms sites that will not process your bulk text messages if your Nigerian phone numbers do not start with the first "0" or "234". This might be frustrating if you need to send a message to thousands of phone numbers without the leading zero. Anyway, don't fret. You can add the leading zero to all your numbers in excel at once using the Excel TEXT function. The Text function will add zero in front of numbers, and make the new numbers with leading zeroes in certain length. The first column of this example spreadsheet contains a list of Nigerian phone numbers without the first zeroes. 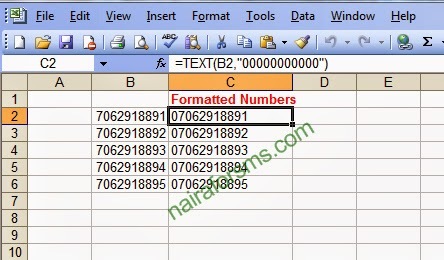 ==> Enter the formula =TEXT(B2,"00000000000") in a blank cell which is adjacent to the first data cell. Change the B2 in the formula to that of the first cell in your spreadsheet. C2 is the adjacent cell to B2 in my sample spreadsheet. ==> Drag the fill handle of C2 across the range that you want to fill. The screenshot above is what the fill handle looks like. You should see that all the numbers in B2:B6 have been copied and pasted to C2:C6 with leading zeroes. And each numbers contains 11 digits.